Got a few returns after your Amazon spending splurge? 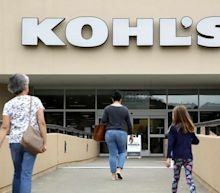 You can head to Kohl's. Those wary of package thieves can now add an extra measure of security to their home. Amazon is officially launching its Key in-garage delivery service, which it began testing in 37 US cities earlier this year. Now, Amazon's Key service, including Key for Garage, is available for Prime customers in 50 US cities . The service is intended for customers with a myQ smart garage door opener, which allows you to open and close your garage door with your smartphone. You can now give Amazon couriers access to your garage, which allows them to place your packages securely inside. Ever since the surprise liquidation of Toys R Us, Hasbro has been stuck shadow boxing with inventory. Given that no one knew that Toys would just close one day, it was particularly onerous for producers like Hasbro which are just doing their job trying to meet demand for their basic products. When the doors close on an institution like Toys R Us you would think that someone would know where all of that excess inventory went to. The company, facing intense competition from Amazon.com Inc and Walmart Inc, has focused on its promoted listings program and payments business, as well as worked to make its platform simpler to use through the introduction of grouped listings and personal recommendations. More than 800,000 active sellers took advantage of the promoted listings in the first quarter, helping more than double advertising revenue to over $65 million, the company said. Chief Executive Officer Devin Wenig on a post-earnings call reiterated that the company was reducing third-party ads that are not accretive and remained on track toward a $1 billion advertising revenue opportunity. StockTwits, the popular social media platform for market savvy traders and investors, is set to launch a free trading app in 2019. A camera could be watching you. It's a new technology being trotted out to retailers, where cameras try to guess your age, gender or mood as you walk by. The intent is to use the information to show you targeted real-time ads on in-store video screens. The garage is about to become the largest parcel locker in America. E-tailer Amazon.com, Inc. (NASDAQ: AMZN) and Chamberlain Group, the maker of garage door openers and remote control devices, announced a joint venture to give Amazon delivery drivers access to residences by opening the garage door and placing packages inside it. The initiative is Amazon's latest effort to service consumers who aren't home to accept deliveries and who don't want packages left outside the property. Amazon.com Inc. is scheduled to report its first-quarter earnings on Thursday after the closing bell, and J.P. Morgan thinks 2019 will be all about revenue growth. “We look for Amazon to stabilize revenue growth more this year, which we believe is important as Amazon remains a growth story and it’s too early for the company to be in harvest mode,” analysts wrote. J.P. Morgan is bullish on Amazon’s (AMZN) prospects, with U.S. e-commerce sales growing and Amazon’s hold on the cloud, with a 70%-plus share of market. Brazilian retailer Magazine Luiza on Tuesday announced it would start selling physical books online for pickup in its chain comprised of almost 1,000 stores, using its national footprint to compete with traditional booksellers and Amazon.com Inc. The move underscores Magazine Luiza's eagerness to mount a direct challenge to online retailer Amazon, which started its Brazilian operations in 2012 with e-book sales, followed by physical books two years later.